This month has been a rainbow explosion of Taste of Summer artwork! We’ve highlighted creations on the blog, our Facebook page, our Instagram account, and on this special Pinterest board. Sticky Boy even got in on the fun! It’s been a blast. There are still a few days left to order the sensational Taste of Summer paper packet and stamp set before these fruits retire for good. But before we say goodbye to this beautiful duo, we want to leave you with one last burst of fruity cuteness. Our favorite thing about this page is how seamlessly all of the colors are interwoven throughout its various elements. 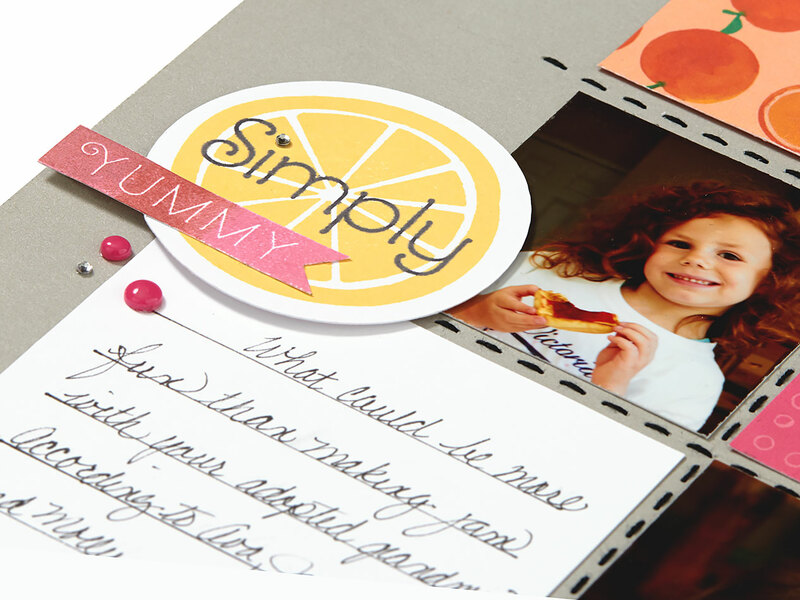 The pops of yellow in the girl’s shirt also appear in the citrus slices and the papers. Purple appears anywhere from the light splatters on the white cardstock to the glitter gems and the Shimmer Trim. So cute! This page is further proof that these papers and stamps are always delicious together, no matter what kind of fruit salad creation you whip up. And so National Scrapbooking Month continues! 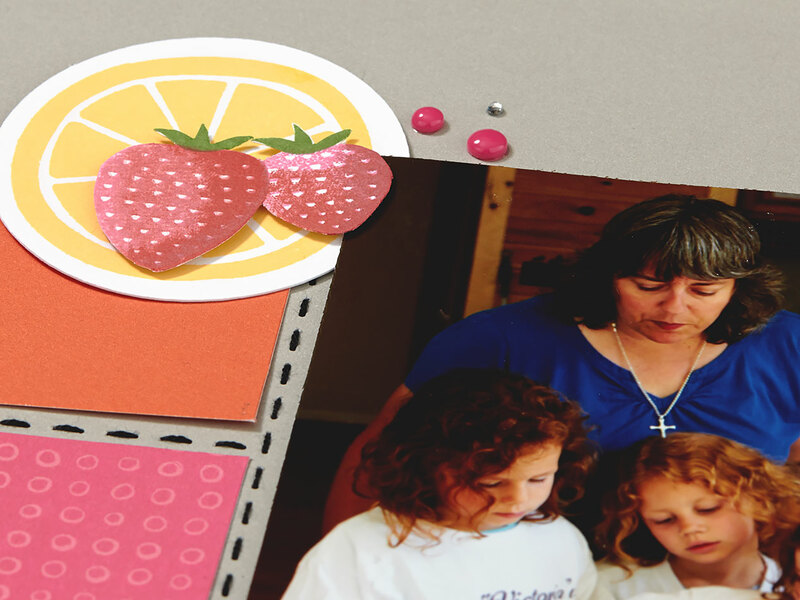 We’re back again with another celebratory project made with the Taste of Summer paper packet and stamp set: a refreshing Taste of Summer mini album. Mini albums are great for compiling your memories from specific events or time periods in a beautiful standalone book, which friends and family can then look through as it sits on your coffee table to get a taste of what you experienced. Because you control the page count and the binding, you have the flexibility to add as many pages as you wish. You decide how much time you put into a single page; you can highly embellish, or, if you prefer, keep the additions to a minimum. Every page ends up unique, and each retains a piece of the memory that you want to portray. 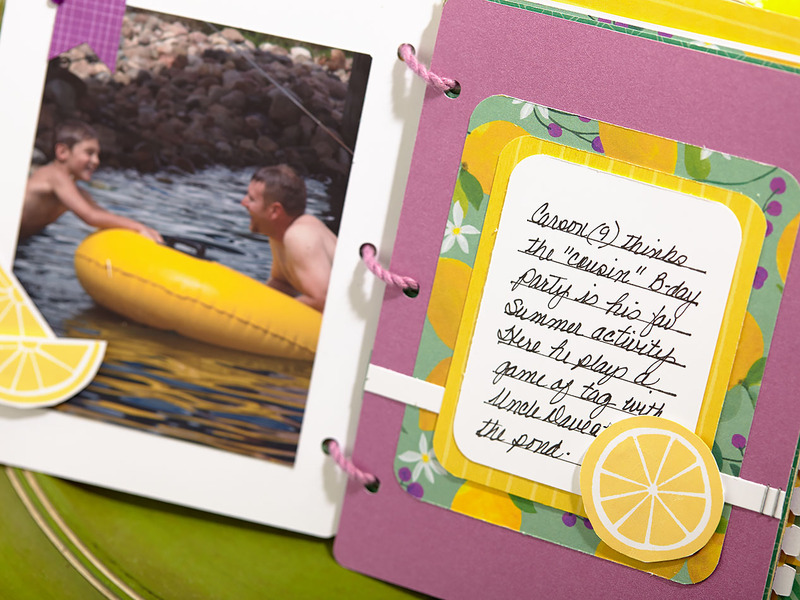 Use the Taste of Summer papers and stamps to create one of your own to capture your day on the lake, your trip to the mountains, or your picnic at the park. • Using the Cricut® Artbooking cartridge, cut pages of all sizes and with varied borders. Mini albums are one of the projects this cartridge was specifically designed to cut, so you’re sure to find everything you need. • Get spunky with your binding. We chose Thistle extra thick twine to bring out the pretty purples in our papers. • Arrange blocks of papers, photos, and stamps in symmetrical patterns to harness the power of excellent design. • Write short and sweet captions for your photos, but leave room for longer journaling entries as well. • Create embellishments with the already adorable paper. Here we’ve dovetailed strips of paper and layered them to make a juicy cluster. • Layer images from the stamp set using 3-D foam tape. • Give your handwritten memories the limelight! Layer blocks of paper and cardstock and fill them up with journaling. • Use mini staples for your mini album—it’s like they were made for each other! • Get creative with your inking. 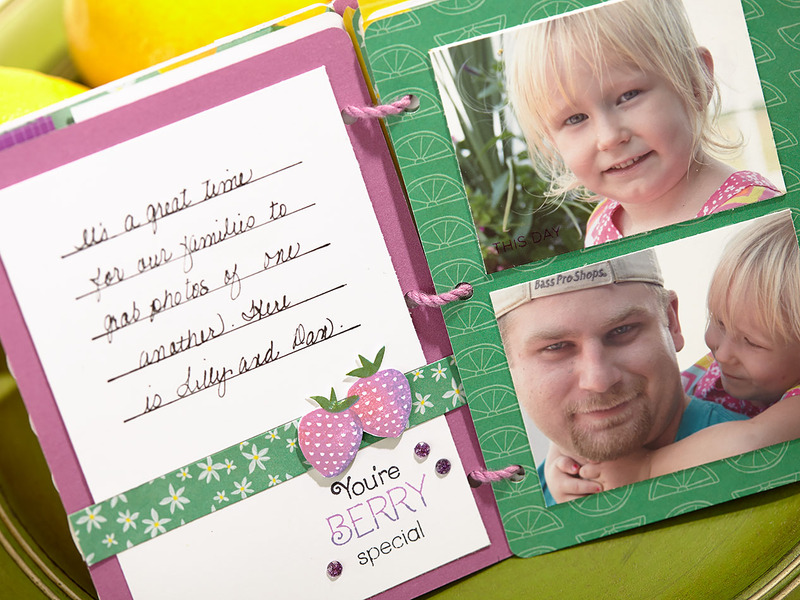 The strawberries on this page were stamped in several colors to achieve a look that’s almost good enough to eat. 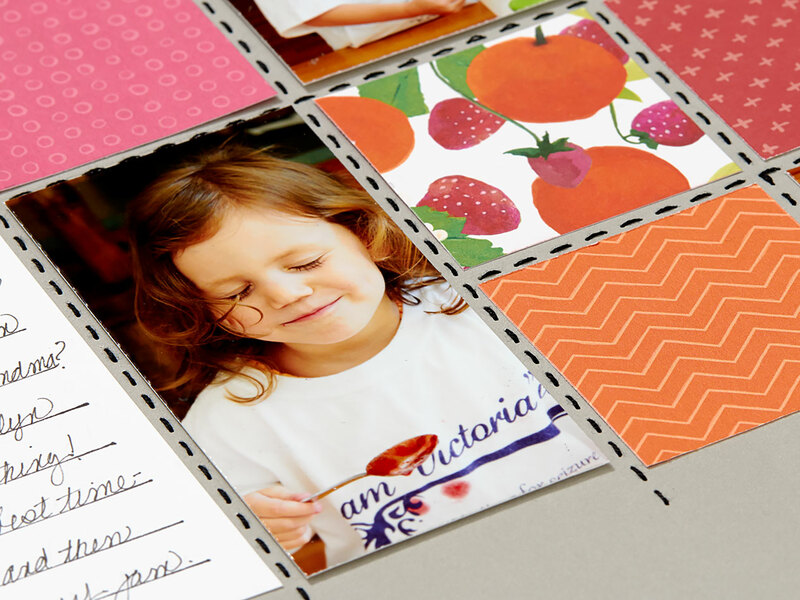 • Stamp directly onto your photos to capitalize on space—and give them fun captions! • Use journaling strips to allow the gorgeous Taste of Summer papers to peek through. 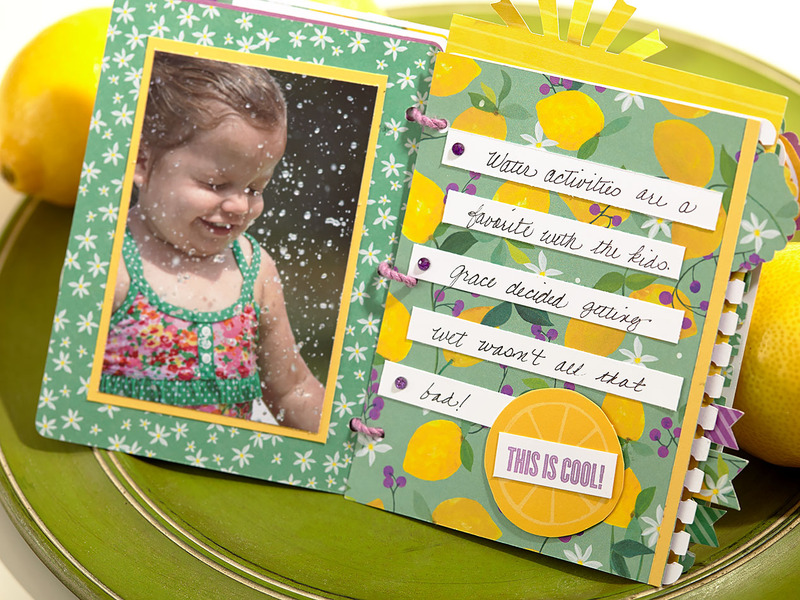 • Layer stamped sentiments on top of stamped images in complementary colors. • Add embellishments for dimensional pops of color. Here we’ve used purple glitter gems to coordinate with the colors of the papers. • Stamp images to create designs on solid-color cardstock. In this case, the stamped vines are more of an attraction than the paper! • Place journaling strips vertically for a new look. Your mini Taste of Summer project is sure to have a big impact. Remember to grab your paper packet and stamp set before the month’s end! 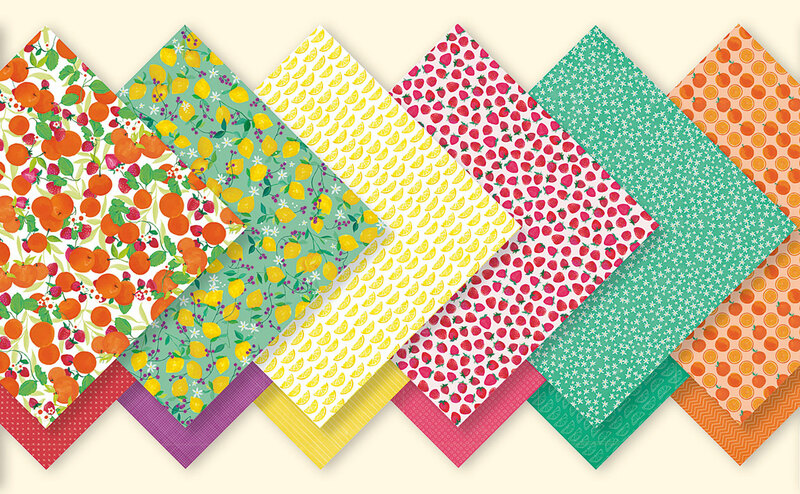 We’re back with another installment featuring the jaw-dropping Taste of Summer paper packet! 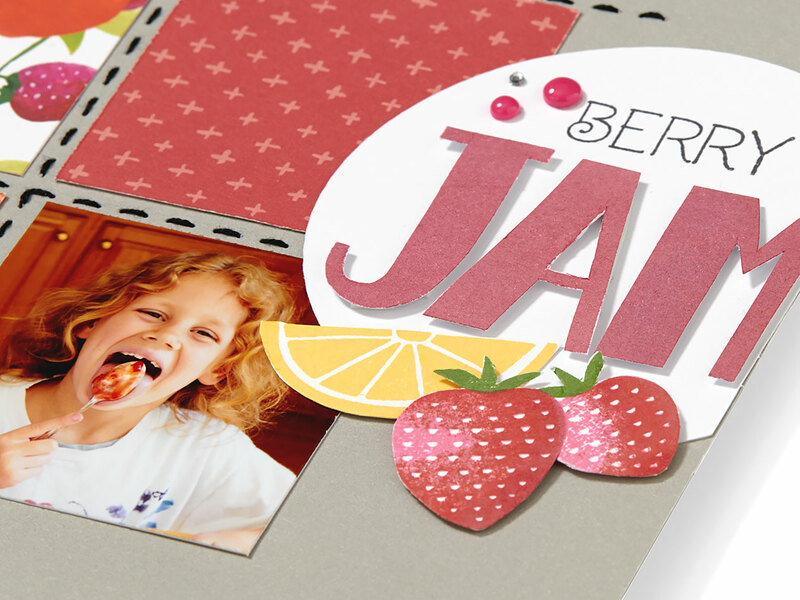 Today we bring you a pocket scrapbooking layout made from these juicy papers that we designed especially to celebrate National Scrapbooking Month, one of our most exciting celebrations of the year. We love the contrast between the black and white photos and the popping Canary and Lagoon! It creates balance within the layout and keeps your eyes glancing back and forth between the smiling faces and the fruity sentiments. 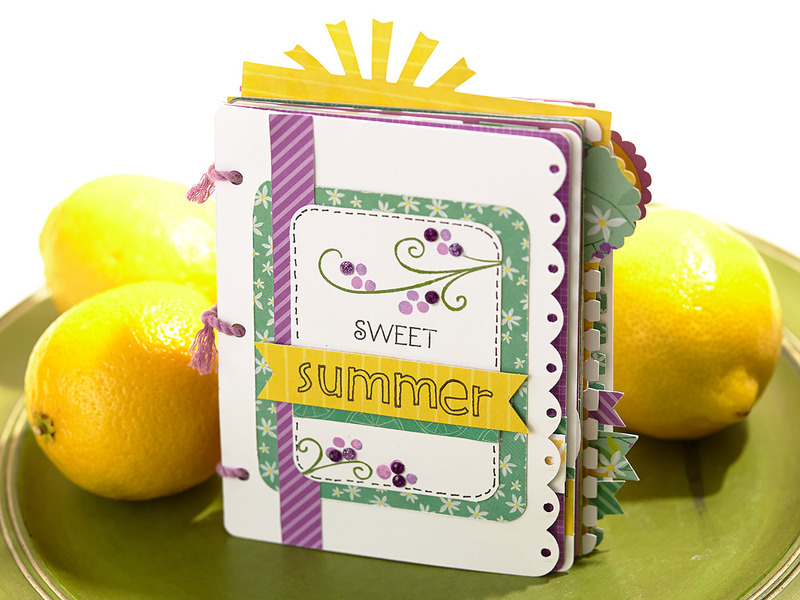 The Taste of Summer stamps accent the papers, photos, and sentiments with just the right amount of zest. It’s so fun to read through the page, discovering how the sentiments and journaling interact with the corresponding photos. It’s all stitched up! Don’t you think these homegrown touches are reminiscent of the simple life that comes with the lazy days and warm nights of summer? Each card tells its own little piece of the story. We think it’s super sweet how this story begins at the top of the page and moves on down along with the progression of the photos—all the way up to the final kiss! We can’t wait to see what stories you’ll tell with your Taste of Summer! Use the hashtag #ctmhtos to share your projects on social media. There’s something delicious in the air, making its way toward your tantalized taste buds. What’s the dish? 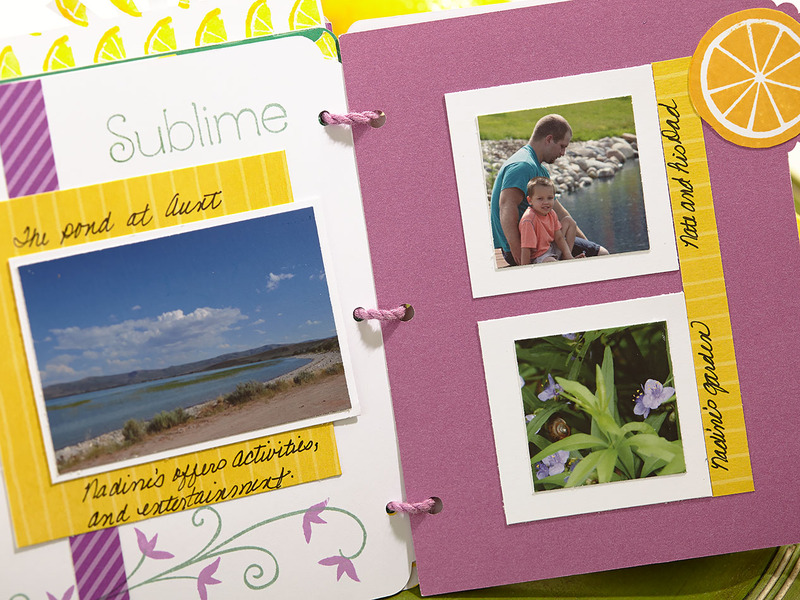 Your very own Taste of Summer specialty, in celebration of National Scrapbooking Month! The Taste of Summer paper packet and stamp set are here to help you celebrate the greatest season on earth. It will be available only during May, but we guarantee you’ll be using it all summer long because it’s downright delicious. We’ll be sharing artwork made with these lip-smacking products all month long through our social media sites, so make sure to check out our Facebook page and Instagram account every day during May. Of course, we’ll also be featuring some of our favorite pieces here on the blog—starting now! It’s time to pull out your summertime photos! The juicy fruits of these papers go together like berries and cream with your summer-themed snapshots. Add the stamp set to the paper and photos, and you won’t be able to rein in your crafting fingers! 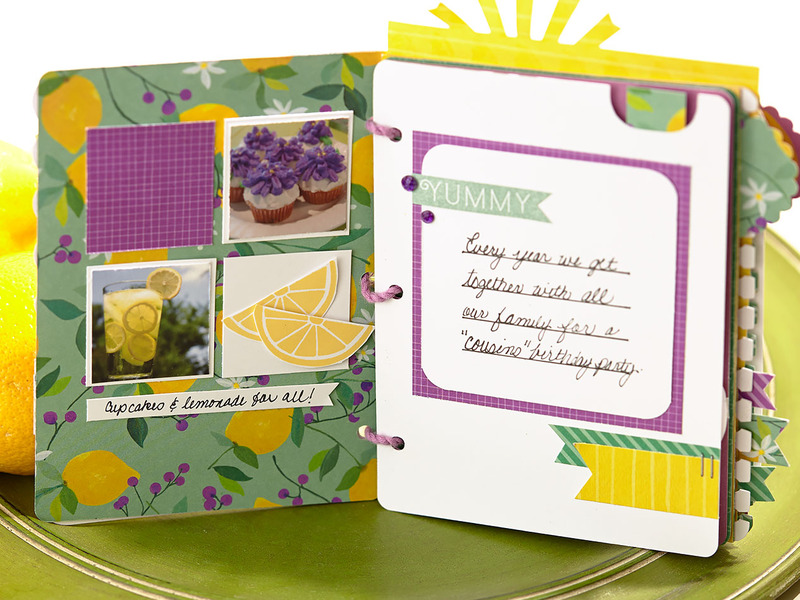 With a change of ink color, you can create a lemon, lime, or an orange, and all from the same stamp. Or split a sentiment and you’ve got dozens of possibilities for titles and photo captions. Most delicious of all, these stamp images can look as mouthwatering as real fruit when you get creative with your inking. We stamped some very convincing strawberries by using the rock ‘n’ roll technique. First we stamped the entire base in Cotton Candy ink, then we rolled just a portion of the stamp in Cranberry and layered it on top. On the far right edge, we finished the look with a roll in Ruby. The “JAM” title is also a mix of inks that combine to make a very berry look: Ruby and Cotton Candy. The “yummy” sentiment we made by stamping the entire base first in Cotton Candy ink, then working our way left. We overlapped half the sentiment with Cranberry ink and added a layer of Ruby to the left end. Mmmm. For an added touch of homegrown, we’ve woven some stitching into the page. Use your stitch guide to create the same look you see here. Don’t forget to leave room for journaling, too, because you’re going to want to document the greatest summer memories you’ve ever had. It’s going to be a great month, and an even better summer. 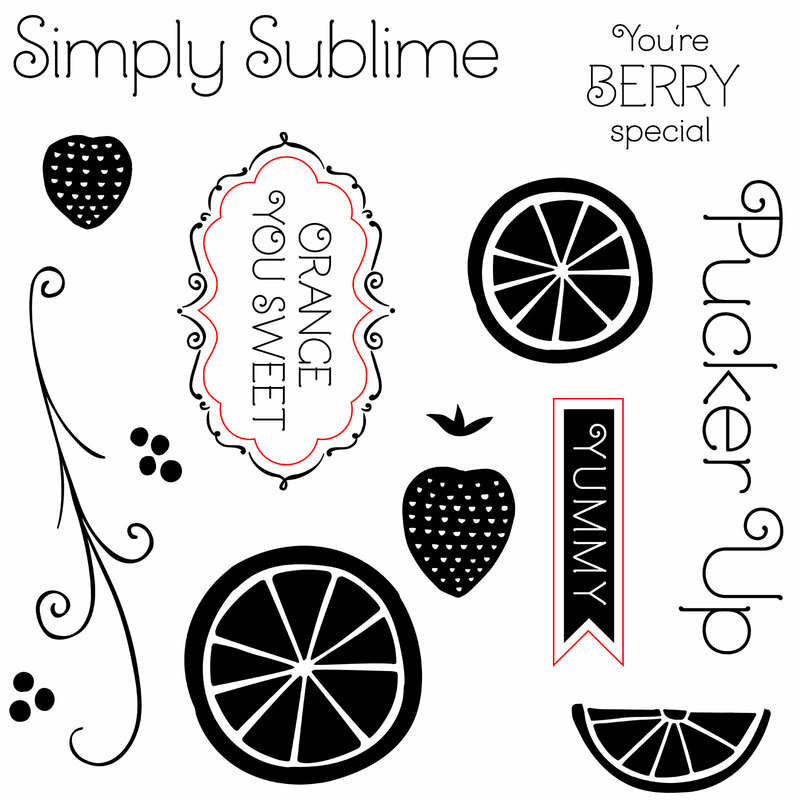 Get your Taste of Summer paper packet and stamp set today!